EXOTIC BIO-CHEMICAL TESTING RANGE CAPITAL OF THE WORLD! At present, Dugway Proving Ground encompasses 798,855 acres. Republican Rep. Rob Bishop said the state must show the Pentagon "what we have." He pointed to the Utah Test and Training Range, a broad military airspace above some 2,624 square miles of land from Hill to Nevada, as the "crown jewel" among Utah's installations. Utah Test & Training Range - Spacecraft Impacts Utah's West Desert at 193 mph! Capsule's chute failed to deploy Samples exposed to atmosphere, are we in danger of ET samples on the loose? NASA's history of spacecraft landing failures continues. > Alien Dave warned us of this situation in Genesis Down last spring, with a possible worst case scenario. "There's no back up plan for failure" said Alien Dave. Clyde Lewis host of Ground Zero Radio also prediced that it would have problems and more than likely go down hard. "Sen. Hatch might want to see whats in his own backyard! " 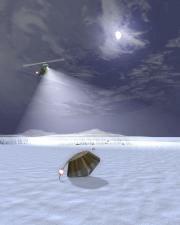 Strange Sight Witnessed by UUFOH Team During Skywatch "What The Bleep?"! Testing Witnessed at UTTR Raises Concern - photos! • Spirit, the Mars lander that bounced onto the surface of Gusav Crater on the red planet Saturday night. Hundreds of Utahns working for ATK Aerospace, headquartered in Salt Lake City, built parts of the project. The nine solid rocket boosters that helped lift Spirit's Delta II rocket into space were constructed at ATK's Thiokol Propulsion operations at Magna and ATK Composites in Clearfield, while the mast for the rover's camera was built at ATK's Magna Space Structures Facility, Jeff Foote, president of ATK Aerospace, told the Deseret News earlier. • Opportunity, a Mars lander which is to land at Meridian Planum on the other side of Mars in about three weeks. It is an identical vehicle to Spirit and has the same Utah connections. • Stardust comet probe, which flew past Comet Wild-2 (pronounced Vilt-2) Friday night to collect primordial material from the earliest days of the solar system, will land in January 2006 at the Utah Test and Training Range in the state's western desert. • Genesis, which has collected samples of the solar wind about 1 million miles closer to the sun than Earth's orbit, is to parachute through the atmosphere above the UTTR on Sept. 8. 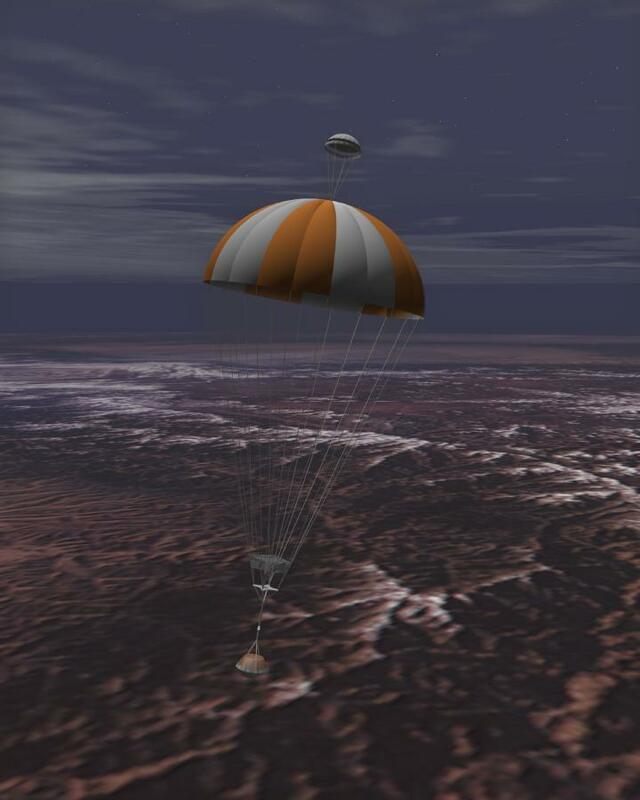 NASA engineers hope to snag the capsule in midair via helicopter. l Where Is STARDUST Right Now? 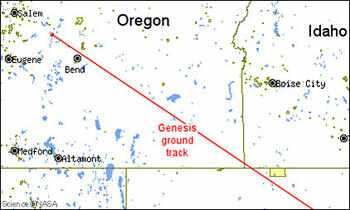 l Comet Fragments to Impact Utah Desert! The Stardust samples are collected by the spike-heating collection technique. the Utah Test and Training Range south of Interstate 80 and west of the Dugway Proving Grounds. UTTR was picked for a landing site because it has 58,000 square feet of restricted air space, an advanced tracking system and a vast landing space. 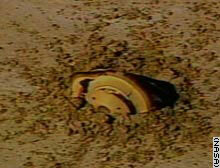 The capsule was to come down close to Wig Mountain on the Dugway Proving Grounds. 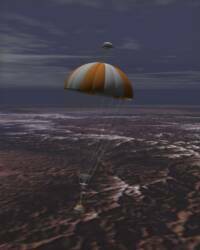 Upon retrieval, the capsule will be taken by the helicopters to Dugway’s Michael Army Airfield, after which the samples will be transferred to NASA’s Houston Space Center in Texas for further analysis. Paula Nicholson, Dugway Proving Ground’s spokeswoman, said to her knowledge, the Genesis landing would be the first for a NASA spacecraft at the Utah Test and Training Range. Though the X-33 spacecraft program slated to land at Dugway was scratched, the Stardust spacecraft, currently collecting comet particle data in space, is scheduled to land at the Utah Test and Training Range in 2006 (stardust.jpl.nasa.gov). Galileo won't be flying into Europa because Galileo could still be carrying microbes, 11 years after its launch from the space shuttle Atlantis. Duane Bindschadler, Galileo's manager for science planning and operations told CNN that "We don't want to get anywhere near Europa, simply because of the possibility of life there," and moreover Andrew Ingersoll of the California Institute of Technology says that "They don't want to crash this contaminated spacecraft into Europa". This is a blatant double standard when you consider the ramifications of an accidental introduction of microbes from a hostile alien environment to planet earth with a project like Stardust. In a report filed by Maxx Damage to the Ground Zero Newsletter from a CNN report, it seems NASA has a double standard when it comes to polluting a planet with space microbes that may kill life forms. The Galileo space probe is in it's final days and the aging probe is ready to be put out of it's misery by NASA. They have the option of waiting for the probe to run out of propellant however CNN reports that there will be a more spectacular finish for their venerable piece of property. NASA has decided to kill the Galileo probe by deliberately crash landing it on Jupiter. It also has been discussed that when the probe gets it's marching papers that it could be crashed into the Volcanic moon Io but definitely not Europa. The reason is incredible considering the downplaying of the danger of project Stardust by NASA. l Perform chemical and biological survivability testing of defense material. l Test environmental characterization and remediation technology. l Act as the Department of Defense Joint Chemical and Biological Defense Contact Point in support of war fighting Commanders in Chief. l Provide support to chemical and biological weapons conventions. l Operate and maintain an installation to support our test mission. As of 29 April, 2004, the recovery test stage has begun for the "Genesis Project".Retrieval and Recovery of the 3 foot X 3 foot space capsule will take place as follows in September. This same foam is being used for a total decon in the event of any Personal, Vehicles or Buildings being exposed to any agent as a result of terrorist activities. The foam, it is said, will kill any thing resulting from Chemical, Biological or Nerve Agent. It is also safe for personal and the environment. After the capsule passes 6000 feet, a recovery helicopter will slowly approach and with a hanging tail hook, like a big fishing pole, the helicopter will snag the capsule by the parachute and slowly take it to a portable containment and decontamination facility which will be set up prior to the capsule re-entry. Also, 2 other portable containment and decontamination facilities will be patrolling the area in the event the capsule does drift off course. All Hazmat Vehicles and Personal will be standing by , which have been equipped with the new foam in the event of any breaks or leakage in or around the capsule in the event that the parachute or helicopter retrieval fails. With all the is in place, we feel comfortable in knowing what is happening and all the safe guards that have been put into place. Even with any strong winds, the chances of the capsule straying over or into any public areas is non existent. Just to much area out here to play in. l >Alien Dave was on Ground Zero Sat. 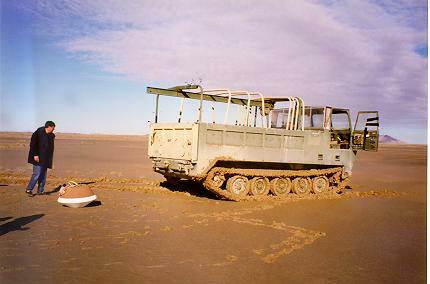 Sept. 11th 12pm to report on the Genesis crash - solar samples force fed "Dugway's peanut butter" (a bio-chemical soup from decades of exotic testing still present in the mud at UTTR.) 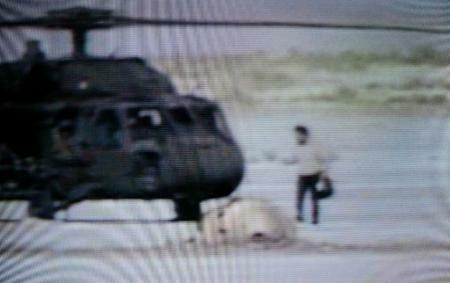 as the capsule impacted the ground and broke open. What can we expect to appear at the impact site next spring after 'whatever' adapts to our environment? Alien microbes / viruses or diseases? and what if the Stardust capsule does the same and crashes? Old School Ground Zero listeners remember that Clyde filed stories about environmental impacts of space vehicles in the west deserts of Utah as far back as 1999. His investigations led to the connections between biological warfare activity, cattle mutilations, and the use of exotic aircraft to deter anyone from reporting the truth. Dugway Proving Grounds has been a facility well known for its cooperation in defense activities, biological testing and space weapon development. 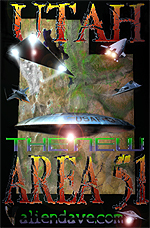 The area has been so active that many people are assuming that the facility is now the new and improved replacement for Nevada’s Area 51. "Warning from Andromeda" about the sample return missions that NASA had planned for the years 2004, 2006, and 2008. His report detailed the possibility of a contamination threat to the Earth if any of these missions were to fail. On September 8th, 2004 the Genesis sample return mission was a failure. This result was predicted on Ground Zero in 1999. Project Genesis was the first U.S. sample return mission since the 1972 Apollo mission. This was the retrieval mission that would set the course for other such missions already scheduled for years to come. The Andromeda warning is something that Ground Zero listeners should take very seriously. There is a remote chance that sample return projects like Genesis could bring with them hazardous microbial life forms from space. This Saturday Ground Zero will take on the controversy with some very special guests. Darlene Cypser is a Director and Legal Consultant for ICAMSR: The International Committee Against Mars Sample Return. Darlene is a Colorado based attorney who in 1993 published a paper "International Law & Policy of Extraterrestrial Planetary Protection" in "Jurimetrics - Journal of Law, Science & Technology" (vol.33 No. 2 pp 315-339 1993). You can preview a synopsis of this interesting paper at: (http://members.tripod.com/~dcypser/pp/etpp.html). Alien Dave Rosenfeld returns to Ground Zero to file his report on what went on the day the probe crashed in Utah. 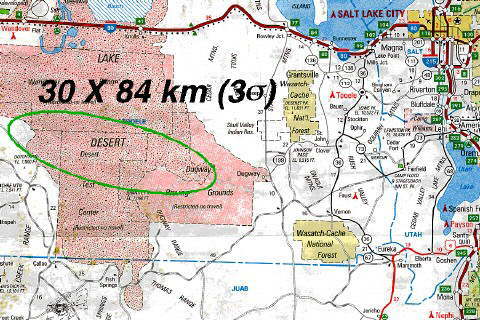 Dave has been investigating the interesting activity in the Dugway Proving Ground Area and continues to take his Utah UFO Hunters on investigations in the area of the crash site. Dave will tell us what the mood was like in Utah the morning of the crash and details on what he has observed at the top-secret facility.